L’Epée’s origins date back to 1839. It was founded by Auguste L’Epée to make music boxes and watch components. Soon the company established itself in watch and clock making. 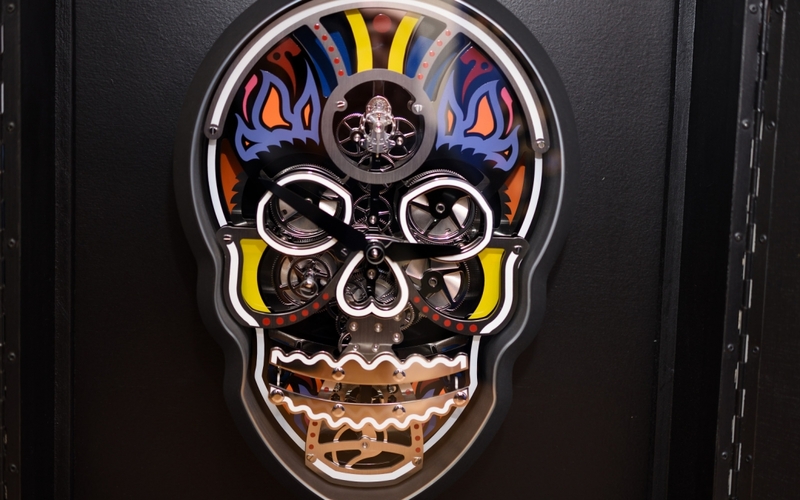 Nowadays, the brand is known for high-end clocks, including exceptional table clocks, classic carriage clocks, contemporary design clocks and avant-garde horological sculptures. 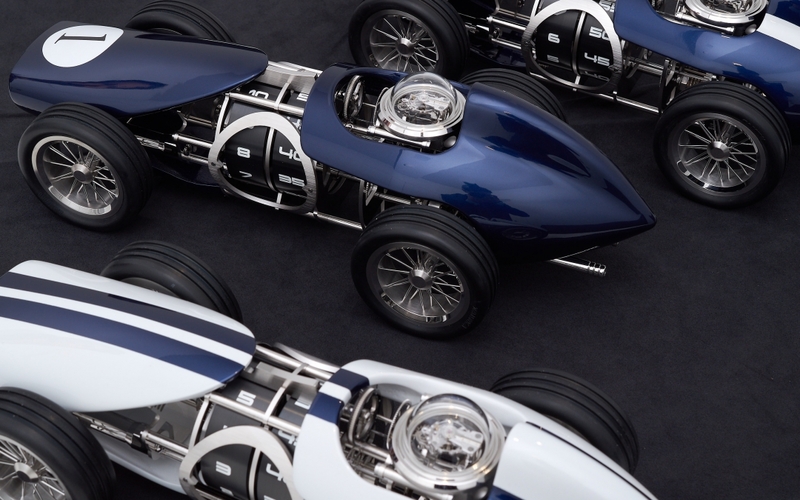 Lately L’Epée has been collaborating with MB&F (Maximilian Büsser & Friends, an artistic concept laboratory in fine watchmaking) on very special pieces, which have resulted in an army of grown-up toys, such as the Sherman, Balthazar, the Arachnophobia or the Destination Moon. 10, 9 … ignition sequence start … 6, 5, 4, 3, 2, 1, 0 … All engines running. April 12 was declared as the International Day of Human Space Flight in dedication of the first manned space flight made on April 12, 1961 by the 27-year-old Russian (at that time Soviet) cosmonaut Yuri Gagarin. The coming years marked many orbital results. 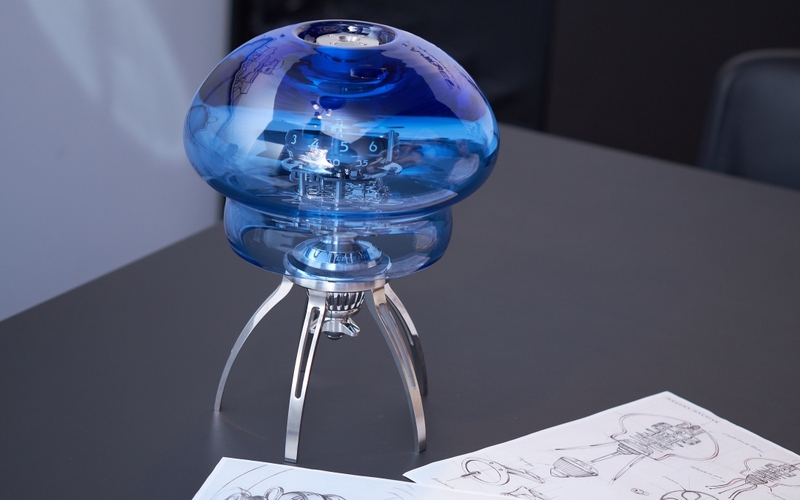 “Space isn’t empty, it’s filled by imagination”, says L’Epée and MB&F and they created a spaceship to let their imagination soar. 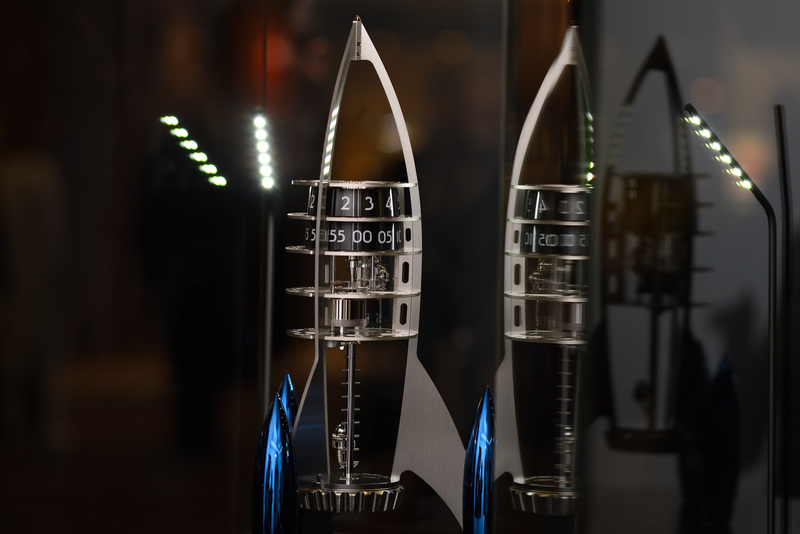 The Destination Moon clock was made in steel with palladium plated brass landing pods. 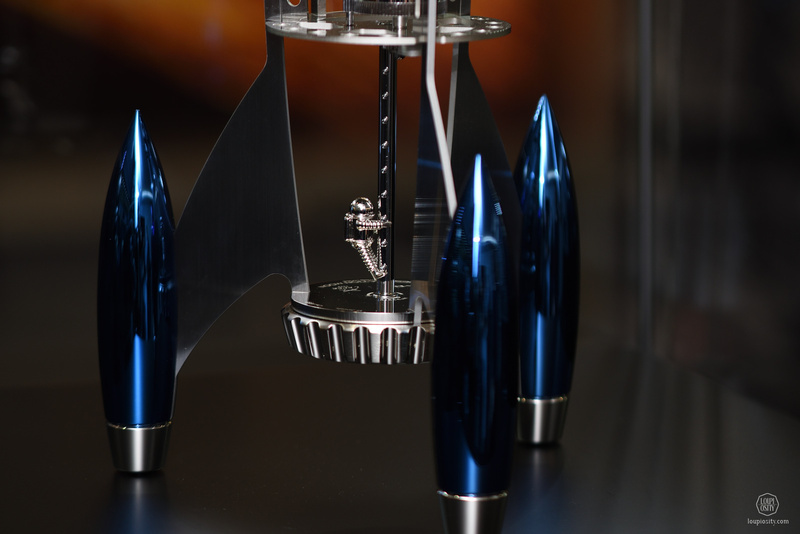 There are 4 different editions, limited to 50 pieces each: a silver edition with no extra coating on the pod, or a black, a green and a blue PVD coating. The cool and minimalistic design leaves the elaboration of details to your fantasy. Hours and minutes are displayed on large diameter stainless steel discs with stamped numerals. L’Epée designed the movement specifically for this piece. 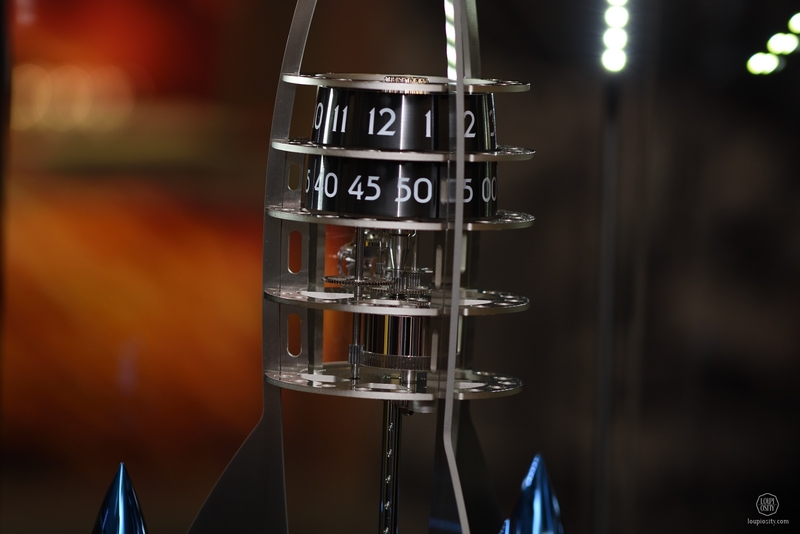 The base where the boarding ladder with the climbing astronaut is set holds the winding crown. Above that the barrel is situated with a mainspring that stores energy for 8 days. The escapement is found in the next level in a vertical position. Time is displayed by two rings – first the minutes and then the hours. Time setting is done by the know on the top of the movement. 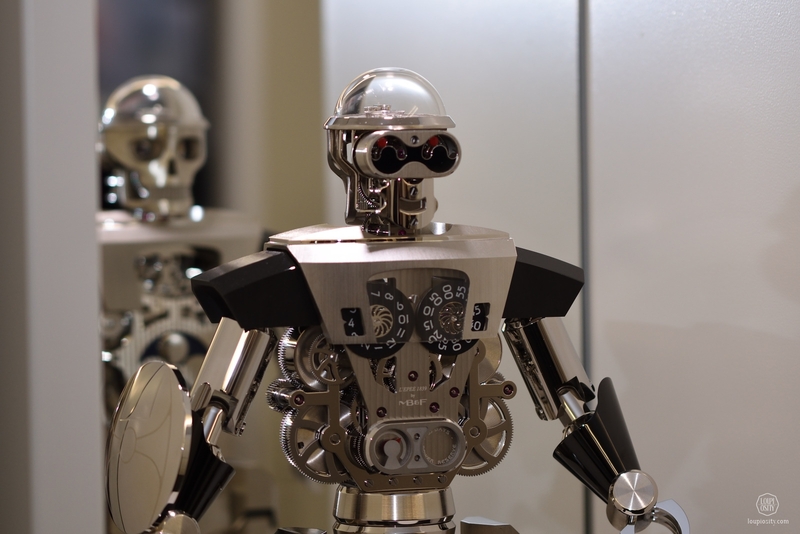 Neil, the “man in the machine”, is made from solid silver and his helmet is stainless steel. He is magnetically attached to the ladder and therefore can be repositioned. L’Epée revealed a gorgeous collaboration just before Baselworld. 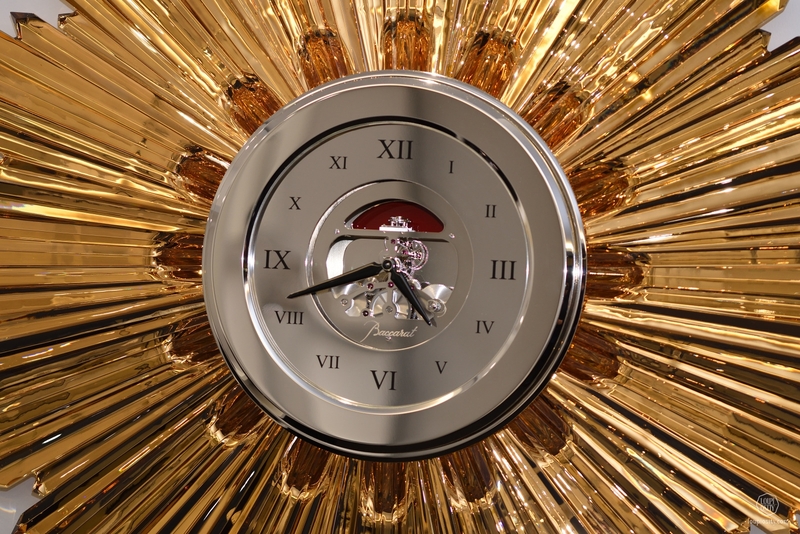 The Sun Clock was made together with Baccarat Crystal. Baccarat is a French manufacturer of fine crystal glassware and their origin dates back to 1764. Louis XV of France (1715-1774 – he was the successor of the „Le Roi-Soleil”, Louis XIV) gave permission to found glassworks in the town of Baccarat in the Lorraine region in France. The 250+ years’ history have had many great milestones, which you can discover here. Being French to the bone, Baccarat even launched a perfume for the 250th anniversary, the Baccarat Rouge 540 Maison Francis Kurkdjian. Throughout the years they have worked with many great designers, such as Thomas Bastide, Philippe Starck or Georges Chevalier, who began at Baccarat in 1916. 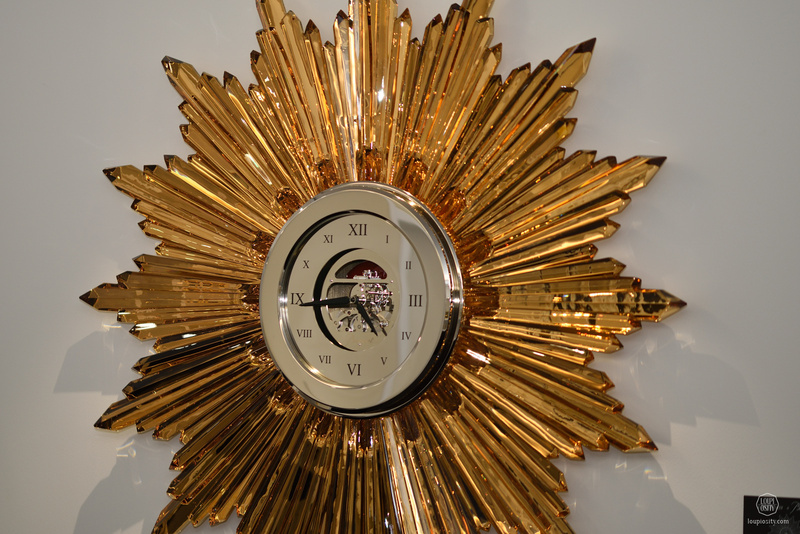 He was active in different areas for an extended period in Baccarat and in 1948, he designed the impressive Sun Clock. Originally the massive creation was displayed in the window of the first Baccarat boutique in the United States, in 1948. Arthur Miller, the famous American playwright lived in Manhattan at the time with his even more famous wife, Marilyn Monroe. The piece caught his eye and Miller chose it to decorate their home. 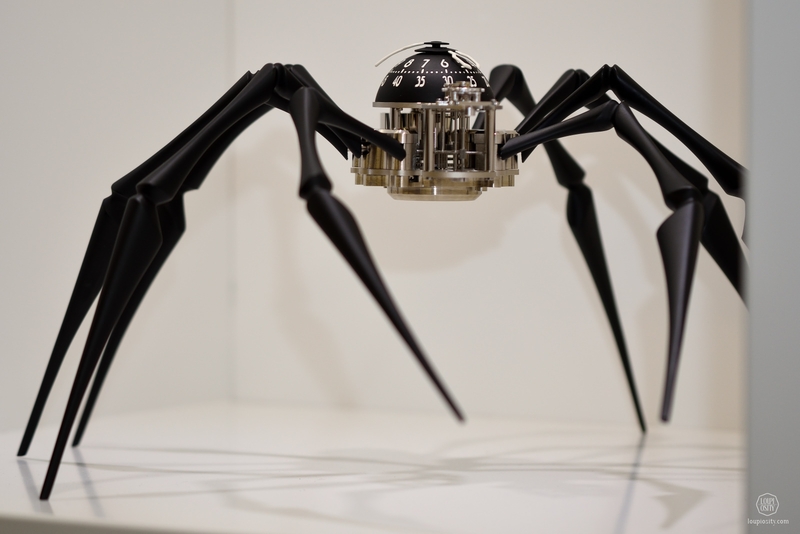 The re-issued clock (a limited and numbered edition of 50 pieces) is one meter in diameter and around 40 kgs in weight. The skeletonized, carefully finished movement of the new Sun Clock is a true L’Epée work with all the signatures of the high-end clock making manufacture. The 25 days power reserve ensures a monthly winding ritual.